Where can you spot a spiky Stegosaurus? Or view a vicious Velociraptor? Or take a peek at a terrible T-Rex? You can do it right here in the time-travelling guide that gets you close to deadly dinosaurs – even though they’re, um, dead! In this prehistoric spotter’s book, you’ll be whisked off on a seriously smashing safari into a long-ago past where the dinosaurs still roam. Just pack your camera, step into your time machine – and whatever you do, don’t get eaten! 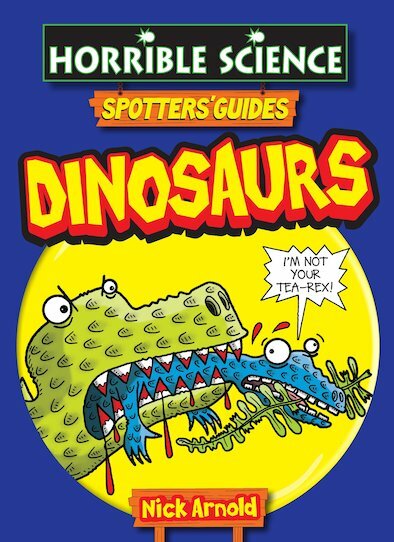 Find out what dinosaur clues to look for, what survival kit to wear, and how to camouflage yourself from the hungry hunters! Check out the Triassic weather forecast, jet off to the ancient island of Pangea – and see which cruel carnivores are close by when you inspect some disgusting dino dung! I am reading this book now and it is soooooooooooooooooooooooo good. I recomend it to people who like Dinosaurs and people who like monsters.